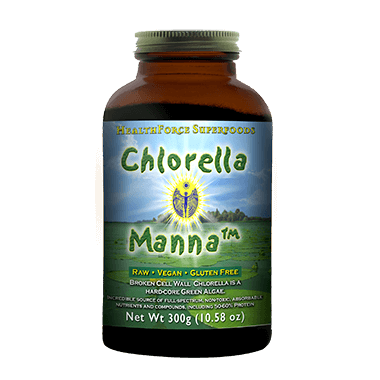 HealthForce Chorella Manna Powder is an incredible source of full-spectrum, non-toxic, absorbable nutrients and compounds, including 50 to 60% protein. Chlorella is the only plant on the planet that can quadruple its growth in less than one day. It contains Chlorella Growth Factor (CGF), which is a potent phytonutrient comprised of amino acids, beta-glucans, nucleic acids, peptides, and polysaccharides. These micronutrients work together to help regenerate cells faster to help your body recover from whatever is ailing you. Suggested Use: Start with 1 teaspoon and slowly work up to one tablespoon per day, either all at once or divided. Chlorella is a food. It can be taken directly, mixed with water/juice, sprinkled on salads, or mixed with food. I switched from another chlorella brand and I'm quite satisfied with this product. It's great for detox and I notice a little more bounce in my step.